The well-being of their residents comes first, and their services are planned to accomodate the individual needs of each resident. They have 62 assisted living apartments and respite services. At El Pomar they strive to reach out to meet the needs of the communities of Colorado. As one of the largest private foundations in the West, El Pomar continues to be among the leaders in philanthropic giving. Demand responsive transportation to seniors and persons with disabilities residing in the service area. There is no fare structure, but donations are encouraged. Contact the agency for more fare information. Springs Mobility is a complimentary ADA paratransit service provided for individuals who, because of their disability, are unable to use Springs Transit, the fixed route bus service. 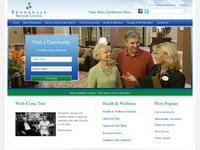 Sunrise Senior Living has been caring for and serving seniors for over 20 years. Sunrise Senior Living has a mission to champion the quality of life for all seniors.